Ghaao is filled with conflict between real and step blood relationship with assortment of Love and revenge. Alizeh and Areesha live with their mother Naseema who is not in a good state of health with respect to her psychological condition. Alizeh realizes her responsibility and is supporting the family. She meets a psychiatrist named Mohid and both become friends. 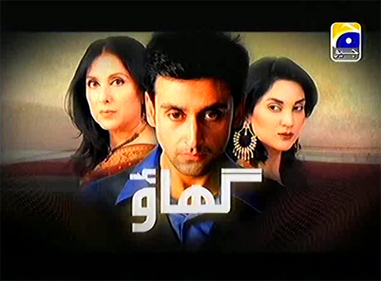 Mohid tries to help Naseema and Alizeh when he understands what situation they are currently in. Mohid and Alizeh start to like each other and eventually end up getting married. On the other hand Areesha is an immature girl and is not as sensible as her sister. She gets trapped in an affair with a bad guy getting herself into trouble. Mohid’s mother Zarqa is a ruthless and coldhearted woman. She is married to Sajjad who is currently paralyzed. Zarqa tries to stop Mohid from getting married to Alizeh but Mohid doesn’t listen to her. After Alizeh gets married to Mohid she’ll experience flashbacks which hold a certain mystery and holds the secret to her past which is not so pleasant. What is that secret and what is the mystery all about?